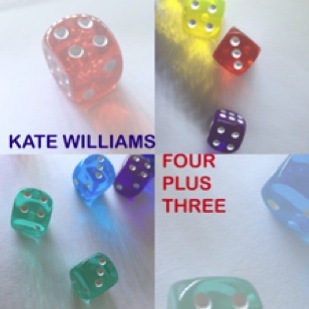 Kate Williams' Four Plus Three is a collaboration between acclaimed jazz pianist/composer Kate Williams and the Guastalla string quartet. It was launched in spring 2016 with a short UK tour and support from Arts Council England. The band received support for the recording from The Ambache Charitable Trust which is active in raising the profile of women composers. The repertoire for this project includes material by Bill Evans, Cole Porter and A.C. Jobim as well as originals by Williams. The style of writing and arranging exploits the varied sound pallet of both string quartet and jazz trio, creating contrasts between the improvised and the notated, and between sustained textures and strong grooves. As with her previous arranging ventures, Kate is seeking a fully integrated approach (this is definitely not a jazz trio with string accompaniment! ), as this line-up provides a wealth of interesting instrumental sonorities. In November 2016 at the 606 Club, the line-up was expanded to include special guests flautist Gareth Lockrane and guitarist Mike Outram as part of the London Jazz Festival. Four Plus Three returned to the 606 Club in June 2017 for a performance featuring special guest John Williams on guitar. The project will be recorded in 2018 with an accompanying 2018/19 tour. Visit here or Georgia Mancio's site for updates soon. Formed in 2013, The Guastalla Quartet brings together Swiss, German and English musicians from three of the finest conservatoires in Europe. Boasting an impressive wealth of experience, between them they have: performed at world-famous venues including the Royal Albert Hall, Wigmore Hall, Konzerthaus Berlin, Teatro Teresa Carreño (Caracas), Katara Opera House and the National Concert Hall of Taiwan; recorded at major studios including Abbey Road Studios, Konk Studios, Air Edel and Paul Epworth’s studio; been mentored by internationally renowned artists such as the Chilingirian Quartet, Heime Müller, Ivry Gitlis, the Coull Quartet and Alina Ibragimova. 2014 proved fruitful with studio recordings of Beethoven, Shostakovich, Milhaud and Dvořák, a mini-tour of Switzerland and Germany funded by supporters of the group, a return to the From The Soundhouse series with Saariaho's Nymphea, and a residency at Norwich Chamber Music Festival.